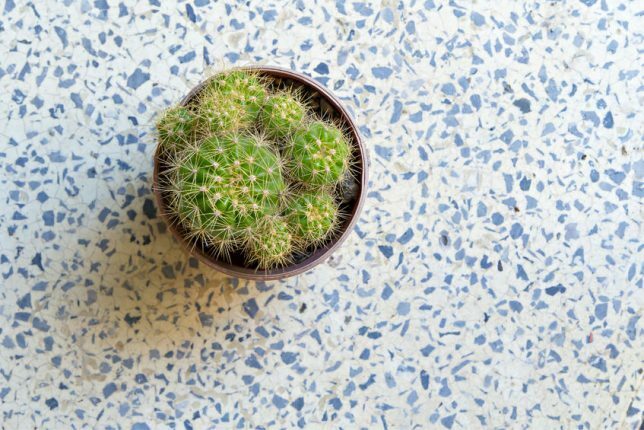 From cork to terrazzo to linoleum, once-popular types of flooring are making a comeback thanks to their eco-friendliness, durability and design appeal. Whether your home is new or vintage, these flooring options will set it apart. Cork – A material that’s been used for centuries, cork is now a green building staple. Cork is an amazing renewable resource sustainably harvested from cork oak trees every nine years. During a harvest, the outer bark of a cork oak’s trunk and major branches is carefully stripped by hand. The tree will regenerate this outer layer throughout its 200-year lifetime. Cork floors offer warmth underfoot, a cushioned surface with slip resistance, and sound insulation. Its earthy appeal comes in a wide variety of patterns – from simple and uniform to complex grained designs. A cork floor is easy to clean and maintain with a damp mop. It naturally contains anti-bacterial and anti-allergenic materials, which is why it’s often used in hot yoga rooms. It’s durable, long-lasting, and resistant to scratches, stains and wear. The cost of cork can range from $3 to $22 per square foot, with an average cost in the $6 to $8 range. Terrazzo – In 15th century Italy, mosaic artists accidently created the first terrazzo floors when they swept bits of marble chips onto their terraces, or terrazzi, and smoothed the surface over time by walking on it. These terrazzo floors caught on quickly and have been used through the ages; they also featured prominently in modernist architectural masterpieces. Terrazzo can be found in many commercial settings today, due to its hard-wearing and long-lasting nature. A traditional terrazzo project consists of a cement and aggregate mix spread over a concrete slab to a depth of about half an inch. It’s a multi-step, labor-intensive process that requires knowledgeable installers. It’s the aggregate, or colorful chips, that create the artistry in terrazzo floors. Terrazzo floors are expensive, with cost ranging from $15 to $100 per square foot; however, they can last a lifetime. The cost will vary depending on whether you choose pre-made tiles or have the floor laid on-site, as well as the materials chosen for the floor (marble, glass, mother-of-pearl, plastic, etc.). Linoleum – Today, linoleum is often confused with vinyl, although the two are very different. While vinyl is a synthetic product made of chlorinated petrochemicals, linoleum is made from a recipe of natural ingredients. Patented by Englishman Frederick Walton in 1863, linoleum is a mix of linseed oil, cork dust, wood flour, tree resins, ground limestone, and pigments pressed onto a burlap backing. Its name comes from the Latin words for flax (linum), the source of linseed oil, and oil (oleum). Linoleum won’t melt like vinyl, and its colors go all the way through, unlike vinyl’s surface-printed patterns. Its vibrant colors are just one reason architects and designers favor it, along with its environmentally friendly creds and natural anti-bacterial qualities. Even in harsh commercial environments, linoleum can last for decades. Because it’s porous, applying acrylic sealer once a year is recommended to maintain its resiliency, although some manufacturers provide a water-resistant factory finish. To clean, damp mop with a pH-neutral cleaner. One drawback: Newly laid floors give off a pronounced linseed-oil smell, but it disappears in a few months. Sheet linoleum runs $3 to $4 per square foot installed, about the same as vinyl sheet flooring; tiles run between $4 to $6. Find a qualified flooring contractor near you. The installation of these unique types of flooring is best left to experienced professionals. Contractor Connection’s expert contractors have already been vetted for the proper licensing and insurance, and their workmanship is warrantied for a full three years. For a free, no-obligation estimate from a contractor in your local area, simple enter your ZIP code above.